The holiday season is here and so it time to loose control of our diet and bake those delicious special cakes. Let me kick off the season with a special apple cinnamon cake baked in a circular mold called the “Savarin mold”. Let me give a brief description of cakes in the circular form found across the globe. The most famous circular cake is probably the Gugelhupf, popular in the Germanic countries. The cake in the English speaking world is more commonly known as the Bundt cake and baked in a Bundt mold. In France the same mold is called the Savarin mold. Why? Jean Brillat-Savarin was a French lawyer and a known gastronome that lived two centuries ago. His name was given to a circular cake made by Auguste Julien in 1856, which he dipped in rum syrup originally created by Savarin. Since then round molds to bake cakes in France are called the Savarin mold. Now here is the recipe of an apple cinnamon cake, however I baked it in a Savarin mold for two basic reasons. First it looks different and I find it more aesthetically pleasing for the holiday season than a simple cylindrical cake. And secondly, for circular hollow molds the center of the cake is well done and also the cake is baked faster than the cylindrical ones. So here is the recipe for the apple cinnamon savarin cake. In France, the circular hollow baking molds are called the Savarin mold. 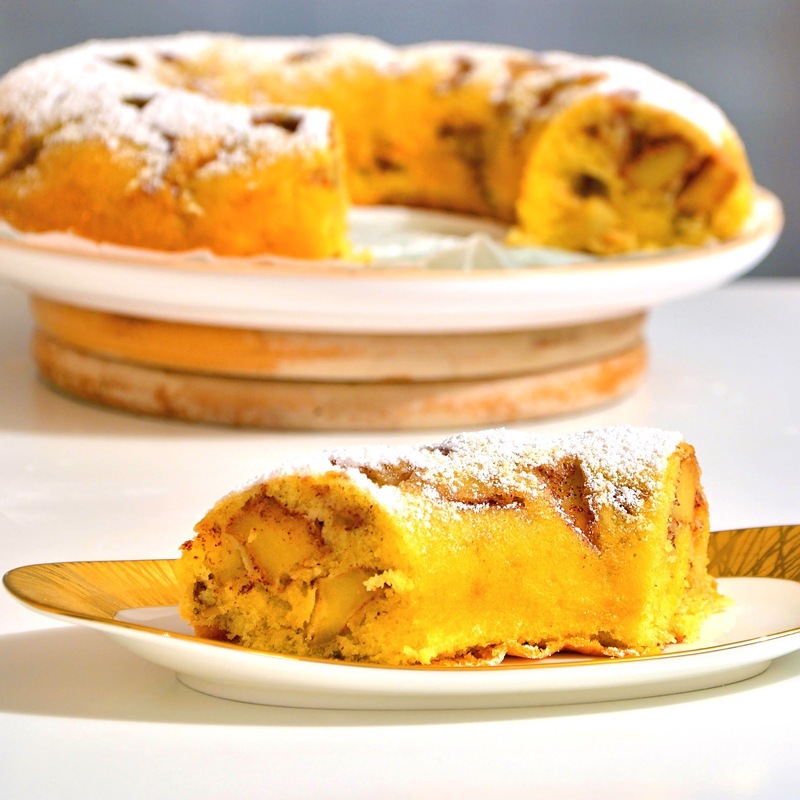 This is an apple, cinnamon cake baked in a Savarin mold, an ideal for the Holiday season. Peel the apples and chop them into cubes. Add the cinnamon powder and 1/3 cup sugar to the apples and toss well to coat each cube with the cinnamon and sugar. Keep it aside. Take the eggs in a deep bottomed bowl. Add salt and beat the eggs with a whisk. Now add the rest (2/3 cup) sugar and whisk well. Add the vanilla essence and whisk. Add the shifted flour and baking powder to the bowl. With the help of a spatula mix it well into the batter. Now add molten butter to the batter and mix it well with the whisk. Now add the apples to the batter and fold the batter with the help of a spatula. Butter a non-stick Savarin pan (or a Bundt cake mold). Pour the batter and bake it for 40-45 minutes at 180°C. Take it out from the oven, let it cool a bit. Unmold it on a plate and sprinkle the icing sugar on it. I don't have a cylindrical or savarain mould. Can I use a 10 cup bundt pan greased well? Or maybe a normal round pan? What size?